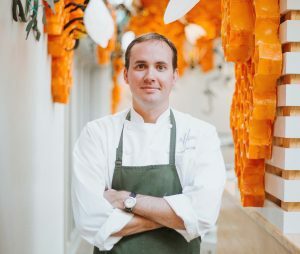 Executive chef Matthew McClure of The Hive at 21c Museum Hotel Bentonville has been named a semifinalist for the 2019 James Beard Foundation Restaurant and Chef Awards in the Best Chef: South category for the 6th year in a row. The full list of semifinalists can be found online. Established in 1990, and often referred to as the “Academy Awards of food,” the James Beard Foundation Restaurant and Chef Awards recognize culinary professionals for achievement in their respective fields. The prestigious group of semifinalists across all categories represents a wide collection of culinary talent, from exceptional chefs and dining destinations nationally and across ten different regions to the best new restaurants, outstanding bar, outstanding baker, and a rising star chefs 30 years of age or under. The final list of nominees for all award categories will be announced at a press conference in Houston on Wednesday, March 27 at 10 a.m. EST. Nominations will be streamed live and announced in real time on Twitter. “It is an honor to be affiliated with an organization that is working to create a more sustainable and diverse food culture for everyone. I am thrilled to be considered for this coveted award for the sixth year in a row and bring well-deserved recognition to the cuisine of my home state. It is a testament to the hard work and values of the team at The Hive,” said McClure. The Hive represents McClure’s take on the “High South” – his home state’s distinct culinary identity—in dishes like Sorghum-Roasted Duck with hominy grits, and a wood-fired Hog Chop with Ralston Rice. McClure was a James Beard Award semifinalist for the “Best Chef: South” category consecutively from 2014 to 2018, and was a speaker at the 2016 James Beard Foundation Conference: Now Trending: The Making of a Food Movement. He was awarded Food & Wine Magazine’s “The People’s Best New Chef” award for the Midwest in 2015. He is also an active member of the Southern Foodways Alliance and supporter of No Kid Hungry. McClure was born and raised in Little Rock, Arkansas, where hunting, fishing, and his grandmother’s cooking ignited his passion for food. After studying at the New England Culinary Institute in Vermont, he settled in Boston working at a number of restaurants including Troquet, Harvest and No. 9 Park under the direction of Barbara Lynch. After years in Boston, he was eager to get back to his home state to reconnect with the ingredients and foodways of his childhood. He returned to Little Rock where he worked under Lee Richardson at Ashley’s at the Capital Hotel, developing strong relationships with local farmers and producers, and rediscovering the agricultural resources of his home state. In 2012, he joined the opening team of The Hive, located at 21c Museum Hotel Bentonville.